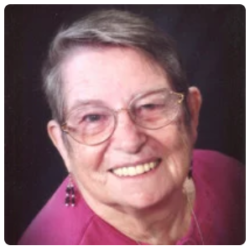 Joyce Clark, 90, Green Bay, passed away unexpectedly during a medical procedure Tuesday afternoon, April 2, 2019, at a local hospital. Born July 1, 1928, in Green Bay, she is the daughter of the late Robert and Rose (Kamps) Streckenbach. Joyce is a graduate of West High School, Class of ’46, and attended La Crosse State College. She married Francis J. Clark on April 15, 1950 at St. Patrick Church and he preceded her in death on April 23, 2004. Joyce will be remembered for her caring spirit, great sense humor, and helpfulness to others. She enjoyed crafts, woodworking and especially stained glass art. She was most proud of her family and the many friends that she had made over the years. Joyce is survived by her six children: Mike (Pat), Sun Prairie, Paul (Teri), Cedar Rapids, IA, Matt (Renee Janus), Allouez, Joel, Green Bay, Mary (Dan) Gould, New London, and Chris (Kelly Anderson), Raleigh, NC; 10 grandchildren; and several great-grandchildren; various in-laws; nieces and nephews. She is preceded in death by her parents; husband of 54 years, Fran; brother, Robert Streckenbach; and sister, Lois (Rob) McAllister. Visitation at Malcore (East) Funeral Home, 701 N. Baird Street, Sunday, April 7, 2019, from 2pm until the time of the funeral. Funeral service, 5pm Sunday with Deacon Bill Burkel officiating. Entombment in the Shrine of the Good Shepherd Mausoleum. 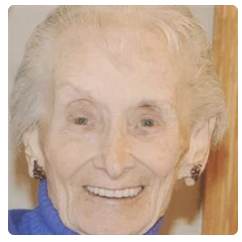 Lucille M. Liebergen, 94, found peace, Monday morning, April 8, 2019, while at an assisted living facility in Dyckesville. Born Nov. 30, 1924 in Green Bay, she is the daughter of the late Antone and Anna (Ropson) Liebergen. She attended Saints Peter and Paul Grade School and graduated from East High School, Class of 1942. Lucille worked at Hills Department Store, Craft Cheese, Shepherds Cheese and finally at Pauly Cheese until they closed. Lucille then retired in 1963. She loved making afghans and was a spiritually devoted woman who never missed mass. 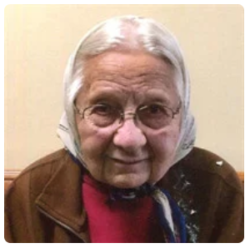 She was a life-time member of Saints Peter and Paul Parish. Lucille is survived by two Godchildren, Jean Marie Guillaume Sears of Green Bay and David VandenHouten of Casco; and many other friends. She was preceded in death by her parents, Tony and Anna; brother, Edmund “Eddie”; and sister, Alice Craanen. Visitation at Saints Peter and Paul Church, 710 N. Baird Street, Saturday, April 13, 2019 from 9am until the time of the funeral. Funeral Mass, 10am Saturday at the church with Rev. Anthony V. Cirignani, OFM officiating. Burial in Allouez Catholic Cemetery. Malcore (East) Funeral Home is assisting the family. Lucille’s family extends a thank you to Ida Mae DeBauche, the neighbors on Farlin Avenue, Unity Hospice for all their care, and to Fr. Tony for his wonderful friendship. A special thank you to her new, extended family at Autumn Fields, Dyckesville. Barbara May Moore passed away at her home following a short battle with cancer. She was born June 22, 1936 in Sturgeon Bay to Esther & Ellis Holmes. She graduated from Sturgeon Bay High School in 1954 where she was prom queen. On Sept 22, 1956 she married Robert D. Moore in Sturgeon Bay and they celebrated their 60th Wedding Anniversary Sept 20, 2016. He preceded her in death September 24, 2016. She attended the University of Wisconsin-Green Bay and graduated from Bellin School of Nursing. Her nursing career included working as an RN at Bellin Hospital, St. Vincent Hospital and Paddington Station. She also enjoyed a second career with University Travel & Moore Fun Tours and was a partner in the travel business. Barbara was a long-time member of Ss Peter & Paul Parish where she was a Eucharistic Minister & head of the Greeters. She served in many positions in the parish when her children were attending Ss Peter & Paul School. loved gardening & living on the bay and cherished the friendship of many friends. Phillip (Barbara) Holmes,Whittier, CA, sister-in-laws, Maryann Moore, Karen (Chuck Townsend), and brother-in-laws, Kenneth (Jane) Moore, Mike (Carol) Moore & Tim Moore. Preceding her in death were here husband, Robert D. Moore; her parents, Esther & Ellis Holmes; sister & brother-in-law, Mary & Dan Grace, brother-in-law, David Marsh; son-in-law, Jim Witynski; in-laws, Edward, John, James, Dale, Daniel,and Thomas Moore, Elaine Klaubauf and Maureen & George Sawyer. Visitation for Barbara will be at Malcore (East) Funeral Home, 701 N. Baird St, Green Bay, on Friday, April 12, 2019 from 4:00 pm-8:00 pm. A prayer service will be held at 7pm at the funeral home. Additional visitation will be held Saturday, April 13 from 10:30 a.m. to 11:30 a.m at Malcore (East) Funeral Home. Fr. Douglas Leonhardt, S.J., a cousin of Barbara, will celebrate the Funeral Mass at Ss Peter & Paul Catholic Church, 710 N. Baird St, Green Bay at 12:00 pm (Noon) on Saturday, April 13, 2019. Barbara’s family would like to thank Rachelle, Sue and everyone from Unity Hospice for their care and true concern. A “special” thank you to her lifelong friend, Maxine Picard. 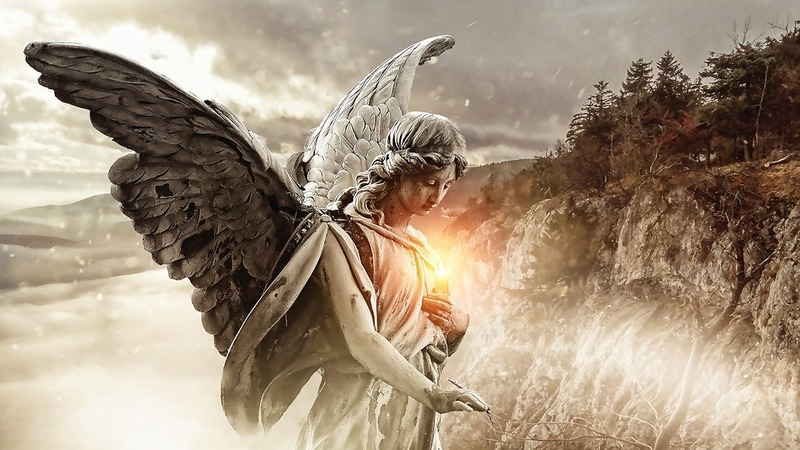 In lieu of flowers, donations may be made to the Altrusa House, 1116 E. Mason St. Green Bay, WI 54301 or Sisters of St. Francis of the Holy Cross, 3110 Nicolet Dr.
Irene M. (Vickman) Heesaker, 94, passed away peacefully on April 10, 2019. She was born February 6, 1925 to the late John & Viola (Davister) Vickman. She met the love of her life, Andrew P. Heesaker, at a roller-skating rink and they married at SS. Peter & Paul Catholic Church on August 29, 1943. She worked at Northern Glove & Mitten on Green Bay’s East Side for 32 years where she sewed government issue gloves and mittens until she retired in 1977, shortly after her beloved Andy went to heaven at a much too young of age. Irene never let the grass grow under her feet. She loved sewing and bowling and travelled both in the U.S. as well as to several foreign countries. She also loved to bake; it was always fun to go to “Grandma’s House” to make Christmas cutouts and her Pecan Pie is legendary! She was a fixture for many years at Swanstone Gardens where she assisted her nephew David Calhoun, with who she had a very special bond, preparing and serving lunches. 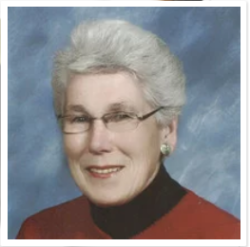 In the later years of her life, she remained active by spending time volunteering at VFW Post 9677 in Bellevue and playing cards at the Allouez Senior Center where she often insisted to be the one to keep score because in her words, “it keeps my mind going”. Irene also loved her Green Bay Packers! She and her husband Andy were original season ticket holders and rarely missed watching a game. She had memorabilia throughout every room in her home, including a Packers/Bear blanket gifted to her by her granddaughter in-law Rebecca, to fuel the fire in the fun-loving rivalry she had with her grandson-in-law Ron, a Bears fan. Most of all, Irene loved and cherished her family. She was an integral part of every one of their lives; there wasn’t a week that went by where either a phone call or visit was made. She will be greatly missed! Irene is survived by her loving daughter Karen (Heesaker) Reeves; 3 grandchildren, Joseph Kamenick, Deborah (Ron) Stott, Andrew (Rebecca) Kamenick; great-grandson Matthew Everard; 2 great-great grandchildren, Serenity Grutza, Charles Schweigl. Irene is also survived by brother Ronald (Joan) Vickman; godchildren, Mark Vickman, Sue Wachowski; 2 sisters-in-law, Joan Otto, Evelyn Heesaker; brother-in-law, Chester Kukla; many nieces and nephews with special thanks to Kathy Vickman; your visits were very much appreciated. She was preceded in death by her husband, her parents; 2 brothers, Harold Vickman, Richard Vickman; 6 sisters, Armella Verheyden, Mable Pansch, Rosella Calewarts, Grace Calhoon, Minerva Pasterski, Dolores Kukla; 2 sisters-in-law, Lois Vickman, Dorothy Heesaker. The family will greet relatives and friends on Monday, April 15th at SS Peter & Paul Catholic Church from 10:00 a.m. until the Mass of Christian Burial at 11:00 a.m. In lieu of flowers, please send donations to VFW Post 9677, 3323 Kewaunee Rd., Green Bay, WI 54311. Malcore (East) Funeral Home is serving the family. Online condolences may be expressed atwww.malcorefuneralhome.com. Irene’s family extends a special word of thanks to the caring staff of Angels on Humboldt and Compassus (Craig, Kelly, Michelle). Irene had many kind words for those of you who assisted her during her stay, and we are truly grateful to you for taking such good care of her!